Business is the engine of our prosperity. At the Chamber, our mission is to create an environment where businesses can thrive and grow so that they can generate wealth and strengthen our community. Learn more about the businesses that are creating jobs and investing in Clinton County. Explore all the businesses that make up our Chamber of Commerce with our online membership directory. Why Wilmington & Clinton County? Learn about the advantages and benefits of doing business in Clinton County directly from the people making the decisions that matter. Brad on why the quality of life in Clinton County matters to his growing business’ success. Renee on the benefits of sitting in the center of the Cincinnati, Dayton, & Columbus regions. Kent on collaboration between businesses, education, and local government. positive job-related news at the Wilmington Air Park was the formation of AMES. The business venture started out with 300-plus employees, many of them aircraft mechanics and engineers who had been working for ABX Air. ABX Air President John W. Graber spearheaded the effort to develop a viable new business in the wake of DHL’s changes in its U.S. operations. The impetus for the new company, said Graber at the time, came from an attempt to devise a way to lever the “core group of highly experienced, highly trained technicians and professionals” already working at the air park and determine whether there was, what amounted to, the makings of a viable company already there, just waiting to be developed. The conclusion was yes, indeed, Wilmington continues to provide the workforce, infrastrucure, and facilities to support a vibrant aerospace economy. Airborne Maintenance & Engineering Services, Inc.
Airborne Maintenance & Engineering Services, Inc. (AMES) is a one-stop aircraft maintenance, repair, and overhaul provider operating out of Wilmington Air Park and at line maintenance stations at the Greater Cincinnati Airport and Miami International Airport. AMES’ maintenance heritage dates to 1980, when it began life as the in-house aircraft maintenance operation for Airborne Freight Corporation, more commonly known as Airborne Express. During this period, the organization developed a reputation for unmatched reliability in the industry, a legacy that continues to this day. In 2003, DHL Worldwide Express acquired Airborne Freight Corporation, and its airline and aircraft maintenance operations were restructured as an independent public company. In May 2009, AMES was reorganized into its current form as an independent maintenance, repair, and overhaul provider. AMES provides heavy maintenance, line maintenance, material sales and service, component repair and overhaul, and engineering services to aircraft operators. Within three large hangars at the Wilmington Air Park totaling more than 200,000 square feet of space, highly trained technicians overhaul aircraft, perform routine inspections and repairs, and schedule maintenance services. The hangars also house several shop areas and offices for support of the aircraft, customers, and staff. A fourth hangar is planned for completion in 2013. AMES also operates a 100,000-square-foot Base Shops facility at the air park with extensive component repair capabilities. Brad Heath, Director of Business Development at AMES, on why the quality of life in Clinton County matters to his growing business’ success. ABX Air, Inc. (ABX) is an all-cargo airline headquartered in Wilmington. The airline began when Airborne Freight Corporation acquired Midwest Air Charter, a regional cargo operation, in 1980. Operating as Airborne Express, it quickly became the third-largest express freight company in the United States, as ABX developed the expertise needed to move millions of pieces of freight every night in and out of its national air hub in Wilmington. When Airborne Freight Corporation was acquired by DHL Worldwide Express in 2003, ABX became an independent public company. DHL remains the airline’s largest customer. ABX operates a fleet of more than two dozen Boeing 767 freighters flying express cargo routes for customers in the United States and around the world. ABX also offers FAA-certificated flight crew training. It operates three flight simulators at the air park. LGSTX Services, Inc. (LGSTX) is an established provider of aviation-related support and facility services. The company’s heritage is built on three decades of experience maintaining a fully functioning, 1,900-acre airport. In addition to servicing, leasing, and selling a large inventory of aircraft ground support equipment such as power units, airstarts, deicers, and pushback vehicles, the LGSTX team handles HVAC, janitorial, building repair, lighting, grounds keeping, electrical, plumbing, roofing, generator service, aircraft fuel services, and ground vehicle fleet maintenance. ABX, AMES, and LGSTX are all part of Air Transport Services Group, Inc. (ATSG), also headquartered at the air park in Wilmington. In addition to the aircraft maintenance services, air cargo lift, and airport ground services already described, ATSG companies provide aircraft leasing, dispatch and flight tracking, specialized transportation management, sort center management, and air charter brokerage services. ATSG companies employ about 2,000 people worldwide, with about 750 of them working in Wilmington. The company’s common shares are publicly traded on the NASDAQ Stock Market under the symbol ATSG. Agriculture has been a major component of Clinton County’s economy with deep roots of farming planted firmly in the lives of the locals. Agriculture in some way or another affects local residents either through the food eaten as consumers, as farmers and growers, or in job creation. Agriculture remains the top industry in Clinton County. Nationally, more than 16 million Americans have jobs because of agriculture, and America’s farmers keep growing more jobs. Locally, agricultural businesses have contributed to job creation in the surrounding area in either new technology, bringing in new businesses to the community or with unconventional ideas the look beyond the fields of Clinton County to tap global markets. The Center for Innovative Food Technology (CIFT) has provided technical innovations and solutions to the food processing, agribusiness, and agricultural sectors since 1995. These services have been designed to enhance the economic performance of the food processing and agricultural sectors and create new jobs within the industry. Wilmington College and CIFT entered into a partnership in 2010 as one of seven Edison Centers for the state of Ohio. Originally established in Toledo, CIFT operates as a satellite office on the Wilmington College campus. CIFT and Wilmington College are a great fit. As Wilmington College pursued a food development incubator with the Ohio Department of Development, CIFT came on board to help create and expand food processing businesses and/or agricultural businesses in the area. Wilmington College is the only private college in Ohio which has a four-year agriculture degree program. It is one of only two institutions of higher learning in Ohio to offer a degree in agriculture. The other is The Ohio State University. By working with new businesses in non-traditional ways to get up and running and assisting them to grow and expand mainly with new technologies. Operating as a food incubator — food incubators are offshoots of business incubators programs that are designed to support the successful development of entrepreneurial companies through an array of business support resources and services with food incubators concentrating solely on food processing and agribusinesses. By traditional economic development such as new projects as in the case of Tolliver Fields in Wilmington. Tolliver Fields is a 282-acre tract of land between Davids Drive and State Route 134 South. It is a projected zoning-friendly industry park for food processing and baking industries. Because of the agriculture connection in Clinton County and the unique arrangement of the park — it sits on two electric grids and has access to the abundant supply of water offered by the City of Wilmington — CIFT has worked to help bring new businesses to locate at the park. As Ohio officials began to concentrate on luring food processing businesses because of the amount of agriculture produced and the importance of agriculture to the state, CIFT came to Clinton County to help develop one of three new Ohio industrial parks. Working with Ady International and Austin Consulting, CIFT worked to locate areas that would best fit the needs of this type of industry. Seeing the economic need and then the huge advantages of the electric grid and water abundance, CIFT has been an integral component of the development of possible new businesses as well a future job creation. Rob Jaehing, CIFT program coordinator in Clinton County, believes that the potential for Tolliver Fields is significant. At the turn of the 20th Century, George and Parker Buckley owned and operated a wheat buying station in the village of Kingman until 1904 when they moved the business to 320 E. Main St. in Wilmington after they purchased an elevator at that current location. The elevator, which was built in 1899 can still be seen across the city and still stands today as a reminder of a business that has survived not only through the ups and downs or a volatile economy but also weathered the true test of time. Buckley Bros. once consisted of buying and shipping wheat by rail or trading wheat for bran, middlings, and/or flour as well as providing large animal feed supplies to customers with horses. Today, Buckley Bros. Inc. continues serving the local area with their agriculture products as one of the longest running family owned and operated businesses in the area. At the original Wilmington location, Buckley Bros. Inc. provides a unique service to accommodate the customer who needs fast and friendly service. The drive-thru allows customers to never leave their car for those occasions when there just isn’t enough time in the day. The drive-thru is conveniently stocked with pet food, livestock and horse feed, bird seed, water softer salt, and grass seed. Apart from pet and livestock feeds, Buckley Bros. Inc. assists area farmers with a competitive grain market. With two grain facilities in Wilmington that now has a combined storage capability of over 630, 000 bushels and another elevator located just outside of the city that provides an additional 65,000 bushels, Buckley Bros. Inc. grain merchants offer marketing strategies and a fleet of semi trucks to accommodate customers with moving grain at harvest time and throughout the year. Currently, Buckley Bros. Inc. employs 35 and operates six retail stores in Wilmington, Washington Court House, Circleville, Monroe, Morrow and The Plains. It also has more than 33 independent distributors which sell their Betr-Bilt feeds at their own locations. They offer constant support to the local community and surrounding areas through contracting local grain haulers, fuel suppliers, millwrights, and by supporting the local horse industry and 4-H breeding operations. Established in 1896, the Sabina Farmers Exchange began with the DeWine family, ancestors of Ohio Attorney General Mike DeWine. At the same location since its founding at 292 N. Howard St., Sabina, and three families later, the Exchange is now owned and operated by John and Connie Surber who purchased the business in 1999 after John began working there in 1997. Stokes Berry Farm is the largest black raspberry grower east of the Mississippi, with over 40 acres of black raspberries as well as additional acreage that grows red, purple, and yellow raspberries along with strawberries. The farm is owned by Dale and Jane Stokes along with son, Mark, and Mark’s wife, Stephanie. Located at 2822 Center Road outside of Wilmington off State Route 73, the Stokes fruit farm was first established in 1962 with the planting of two acres of black raspberries and later in 1975 strawberries. Today, the entire farm encompasses more than 230 acres used not only for raspberries and strawberries but also rye, wheat, soybeans and field corn. In the early 1960s Dale Stokes wanted to make a few extra dollars and with an agricultural as well as an educational background decided to begin planting black raspberries mainly because of his knowledge of black raspberries being cultured in Europe for medicinal properties. He saw that in this area a lot of red raspberries were being grown and black raspberries weren’t and felt his opportunities would be with the black. As time went by he decided to add strawberries to his fruit farm. Later in 1986, Stokes began reading of the work of Dr. Gary Stoner who was doing important cancer research with the medical properties of the black raspberry. Stokes decided to contact Stoner at Ohio State University. “I contacted Dr. Stoner offering my black raspberries for his research. We began working together and formed a professional relationship. Basically we provide the berries and he does the research,” said Stokes. Stokes credits Joseph Haines, Dave Hobson, as well as the Clinton County Republican Party for making possible the funds for this very important research. “This research has the possibility to save so many lives and will prove to be one of the greatest things the federal government has done. So many people will benefit from this research,” Stokes said. Stokes employs close to 25 seasonal workers to currently help harvest the fruit. With the cancer research going on now with the black raspberry, the demand for the fruit has skyrocketed. “Oregon is the largest grower for the black raspberry,” said Stokes. “They are also involved with the research going on the fruit. Because the demand is so great to start making black raspberries supplements and drinks, the Oregon farms can’t keep up with the demand and are looking to us to help supplement the demand. Right now, not enough black raspberries are being grown in the United States. The Oregon farms are looking to other farms to supply 20 million more plants to produce the black raspberry. With the demand so high that could mean for my farm adding an additional 20 to 30 workers to help harvest the berry.” Dale Stokes Raspberry Farm, LLC, as it is now known, offers consumers a superior product as well as well the local economy by providing jobs to the residents. “From the agricultural perspective here in Clinton County, there is a tremendous potential if people are willing to work together. We have wonderful soils here, a great location, two colleges that are leading in agricultural education. The opportunities exist but it’s the people who make the opportunities successful. This is where our work lies ahead of us here in this county,” said Stokes. With the ending of the Revolutionary War, General George Washington began to allot land in the Ohio Valley to war veterans to help with payment for their service. At this time, Stephan Mason was given close to 1,000 acres in what is now known as Clinton County/Clarksville area. In 1823, Andrew Branstrator purchased approximately 400 acres of the allotment near what is now the Clinton-Massie School. Through the years the farm has remained in control of Andrew’s descendants until today with the current owner being Jon Branstrator. Located at 885 N. George Road near Clarksville, Branstrator Farm is one of the most unique farms in the county by offering area residents a diverse selection of fruit and vegetables to consume as well as entertainment events to attend such as the Strawberry and Asparagus Festival in the summer and the Harvest Festival in the fall. Jon Branstrator has a unique story of his own. Living on the family farm Jon began developing his work ethic with the help of his father. He had perfect attendance at school until he was 14 when his father fell sick with pneumonia and he became responsible for planting over 200 acres of farmland by himself. While at home on the farm, he developed a love for listening to broadcasts from different parts of the world and as he grew he took it upon himself to learn as much about geography as possible which played a major part in his life. Scientist Jacques Cousteau became an important role model for Jon who inspired him to become naturalist. In the late 1980s he moved to Central America where he spent the next ten years traveling back and forth to Ohio. While in Central America, Jon worked primarily in agriculture, developing his skills in seed production and being exposed to harsh weather. When he returned to Ohio, he worked at building ropes course and construction projects. Sixteen years ago, Jon returned to the family farm. The land degradation that he was exposed in Central America inspired him to become more environmentally conscious and he decided to begin to transition the family farm from a grain monoculture operation to one of a mixed fruit and vegetable farm in which he used methods such as crop rotation that help maintain a healthy ecosystem. With all of his knowledge and experiences in agriculture, Jon began applying his skills to making a one of a kind farm that would not compete with his neighbors for production but offer the community a diverse supply of agriculture and events that would not only help with the economy but also by pulling the community together. Jon Branstrator and Branstrator Farm have a rich family history and is an essential part of the community especially when considering that his farm has been established in the county for almost 200 years. Jon, with his positive attitude, the farm with its diverse selection of fruits and vegetables, and the farm’s job creation is a much needed asset to the community of Clinton County. Close to 14 years ago, Tony Nye, Clinton County OSU Extension educator for agriculture and natural resources, along with Rick Stanforth, Clinton County commissioner at the time, united to see if there would be an interest locally in the organization of a local farmers’ market. Nye and Stanforth called for a community meeting to determine interest in the idea. Clinton County Farmers’ Market consists of individual vendors, mostly farmers, who set up booths outdoors to sell produce, fruits and some non-edible products such as homemade soaps, hand-crafted jewelry and other artisan products. 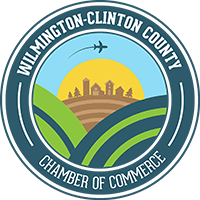 The Clinton County Farmers’ Market adds value to Wilmington because farmers sell directly to consumers, minimizing profit loss and eliminating the need for the middle man. Consumers can buy directly from the farmer or artisan and have the opportunity to purchase organic fruits and vegetables and may enjoy fresh, seasonally-grown food that was produced close to where consumers live. Farmers’ Markets allow money to remain in the local area and the Clinton County community. Clinton County’s strong work force and central location have captivated manufacturing companies for much of the county’s history. Local residents are still engaged in the manufacture of a wide range of products, ranging from automobile parts to medical equipment and pharmaceuticals. Manufacturing represents approximately 20% of the private sector employment for Clinton County, employing more than 3,500 people paying over $137 million a year in annual wages. Ferno-Washington, Inc. started with plants in Greenfield and Washington Court House. When the Air Force left its base in Clinton County in 1971, county officials decided to convert the facility into an industrial park. Ferno’s founders saw an opportunity to consolidate their operations under one roof, and became the the park’s first residents. “The timing was perfect,” said Bob Ginter, vice president of human resources. Ferno manufactures emergency patient handling equipment such as back boards, ambulance cots, neck immobilizers and emergency stretchers. It also produces a line of mortuary equipment including cots, embalming tables and church trucks that wheel a casket down the aisle. The company has wholly and partially owned subsidiaries in several countries in Europe and Asia, with a more than 500 employees across the globe. The Wilmington facility employs more than 200 people. Ginter said that the company has grown stronger during the recession through innovation and creativity, expanding its markets from Europe into Asia and developing a flexible work force in which individuals are trained in multiple areas. Alkermes became a part of the Clinton County community in 1994. In 1992, local entrepreneur Ralph Stolle and DuPont collaborated to develop a biodegradable polymer process in a 13,000-square foot building. In 1994, Alkermes bought that process, and began manufacturing its two main drugs, Risperdal Consta, a treatment for schizophrenic and bipolar patients, and Vivtrol, which treats drug and alcohol addictions. The polymer creates a time release for the medication. This means that a treatment for schizophrenia which usually must be taken twice a day can instead be administered through a monthly or biweekly injection. The warmth and moisture within the body slowly breaks down the polymer, releasing the medication consistently, eliminating the highs and lows from the traditional tablet application. Since production began 20 years ago, the Wilmington facility has expanded regularly. Additional labs and warehouses have increased the size of the building to more than 200,000 square feet, representing a total investment of more than $150 million. Unlike many other industries, pharmaceutical companies are less affected by economic downturns. In September 2011, Alkermes purchased Elan Drug Technologies and added about 23 more drugs to its repertoire. In February, Alkermes partnered with Amglin and Lilly Pharmaceutical companies to launch a new diabetes medication that reduces injections from twice a day to only once a week. In the purchase of Elan, Alkermes also acquired LinkeRx technology, another process to produce extended release medications. The industry is also trending toward contracting out manufacturing. Alkermes is pursuing the possibility of picking up some of this production, an opportunity that could create more jobs in the county. To prepare its workforce, Alkermes has been aggressive in developing training programs for the pharmaceutical industry. These programs enable the company to train new employees who have no previous experience, widening the hiring pool. TimberTech manufactures composite decking. This includes planks, railings and fencing made of a combination of wood and high density polyethylene or poly-vinyl chlorite (PVC). The combination of raw materials renders the structures more durable towards wind and other natural elements, as well as requiring lower maintenance on the final projects. The company has been in Clinton County since 1999. Started as a new department of its parent company Crane Plastics in 1997, the operation quickly outgrew its Columbus location, said Chief Operating Officer Tom Gramlich. Crane Plastics purchased the building formerly owned by Cincinnati Milacron, and moved the plant south to take advantage of the labor force and “good work ethic” in Clinton County. TimberTech employs 225 people in the county. This number includes employees hired through a partnership with Orion, a program for developmentally disabled adults. Each day, 8 to 10 people enrolled in the program go to TimberTech to work cutting parts and labeling sample products. The company displays a commitment to the environment as well as the community. Green recycling bins line the production area. According to Plant Manager Ralph Baker, 90 percent of the waste materials are recycled and nothing is shipped to a landfill. Though forced to downsize in 2009, Gramlich said TimberTech’s production is back up to its pre-recession levels. “We’ve been able to withstand and rebound with the economy,” he said. “We aimed to be ‘right-sized,’ and a continued focus on being the best decking and railing company in the country has enabled us to grow our sales.” Gramlich said he feels “bullish” about the economy. Forecasts for the repair and remodel industries are high for the second half of 2012 and all of 2013. “We’re a privately-held company and we have aggressive plans for growth in the next two to three years,” he said. >> Watch Art Dierks, Vice-President of Operations at TimberTech, talk about the advantages to running a manufacturing facility in Wilmington. New Sabina Industries makes and assembles the instrumentation present in a dashboard, such as speedometers, tachometers and fuel gauges. The company began mass production in Sabina in 1987. Filkins said the company founders were seeking a small town, good relationship with the community, and a stable employment base. They recognized the work ethic required to survive in agriculture, and Sabina did not disappoint. “Statistically, absenteeism is low here — well below the industry average,” he said. New Sabina’s turnover rate is also less than 10 percent, compared to an industry average of about 30 percent. The average employee has been with the company for 14 and a half years. “Our work force is very stable. People have the knowledge, ownership, pride in their jobs,” Filkins added. New Sabina Industries now employs more than 400 people from Clinton and surrounding counties. The 2008 and 2009 recession period was the first time New Sabina Industries had a layoff. At its peak, the company employed more than 500. At its lowest point that number dropped to 350. However, production is once again growing, and with this growth comes jobs. The company recently added 15 employees. According to Filkins, diversification of customers helped New Sabina Industries survive the economic downturn. The company now serves not only Honda, but also Chrysler and Subaru. When Chrysler took a hit during the recession, New Sabina was able to lean on Honda. When Honda was impacted from the earthquake and tsunami in Japan, New Sabina was able to lean on Chrysler. The company recently began working with GM as well. Filkins said that the company was proud to add GM to its list of customers and has “high hopes” for the business relationship. The three industry indexes are quality, delivery and cost. While New Sabina has always led the field in terms of quality and delivery, its greatest challenge is reducing costs. “We see manufacturers move to other countries for cheaper labor, and it challenges us in Sabina to do everything better,” said Filkins. Though it can’t compete in direct labor costs, productivity and technology have enabled the plant to remain competitive. “We’ve not only held our ground, but have increased in size, reverse of the trend of most American manufacturers,” he said. Ahresty Wilmington Corporation has been operating in Wilmington since 1989. The company does high pressure aluminum diecasting, creating car parts often found in the engine or transmission. It also assembles about 70 percent of its cast aluminum parts. When the company’s Japanese managing directors began looking for a suitable factory site, Wilmington was the first place they visited. After touring more than 60 other locations, they returned to Wilmington. Ahresty now employs 469 people in Wilmington. It is the only Ahresty plant in the United States. Other plants are present in Japan, China, Mexico, Thailand and India. Ahresty, like many other companies in the automotive industry, was hit hard in 2008. The company laid off 121 employees. “We downsized, restructured, and now we’re back in a growth phase,” said Rummer. The company has added 80 personnel since March 2010, and Rummer said that the industry forecasts look good. As the industry has evolved, customers have demanded more machinery parts and the technology has had to grow. As a result, Ahresty Wilmington Corporation is an “entity that stands rather on its own,” according to Rummer. Rummer said that Ahresty wants to continue its growth in the United States market, and, while not expecting a production explosion, he definitely expects to see the company return to its 2007 levels of production later this year, and even hopes to exceed those levels in 2013. On Sept. 21, 1951, a new 64-bed, $950,000 “cathedral to healing” center was dedicated at 610 W. Main St., Wilmington. Today, CMH Regional Health System/Clinton Memorial Hospital (CMH) is a 95-bed acute care hospital and outpatient organization which provides services in medical and surgical care, intensive care, obstetrics, inpatient rehabilitation, pain management, sleep care, wound treatment, emergency services and diagnostic imaging as well as the expertise of a clinical laboratory. Off-campus services include a cancer center, home care, outpatient rehabilitation, a family medicine residency and physician practices in family medicine, general surgery, interventional physiatry, neurology, and orthopedics. RegionalCare Hospital Partners of Nashville, Tenn., who purchased CMH in December of 2010, has helped the hospital reinvigorate its well-known reputation as an organization that is willing to invest in the necessary technology, resources, and professionals to serve the residents of southwestern Ohio. CMH continues to recruit physicians while at the same time adding technology, infrastructure and people that are critical to their success and the health of the region. CMH is an important economic driver in the region with more than 700 employees and medical staff of nearly 200 physicians of varying specialties. Medical staff specialties include allergy and immunology, anesthesia, cardiology, thoracic, vascular and spine surgery, ear, nose and throat, emergency medicine, family medicine, gastroenterology, general surgery, gerontology, hematology, internal medicine, interventional physiatry, interventional radiology, nephrology, neurology, oncology, ophthalmology, oral surgery, orthopedic surgery, pathology, pediatrics, physical medicine and rehabilitation, plastic and reconstructive surgery, interventional psychiatry, podiatry, pulmonary medicine, radiation therapy, radiology, rheumatology and urology.